Until the end of 2016, there will be about 25.2 trillion text messages sent (According to Juniper Research). No wonder why messengers are so popular nowadays. Despite the fact that there are big players in the market as WhatsApp, Viber, Facebook Messenger, Snapchat, and others, there are still enough opportunities to create an app like WhatsApp and bite off a considerable market share. All you need is a good idea (we bet you have one), the strong development team that you can find at The App Solutions and consistent marketing strategy. As you can see, WhatsApp is having a leading position in this chart. Even though Facebook bought his messenger in 2014 for $22 billion, WhatsApp still has the largest audience that sends over 30 billion messages per day. The QuickType feature is becoming even smarter. Using the machine learning technology, it can prompt the right words to the user according to the context and user`s style of speech. READ ALSO: How to Use Machine Learning in Mobile App? Emoji are gaining even more power. The size of a text screen is getting bigger, and emoji itself also get predictive text input and suggest replacing some words with these cute symbols. The other massive trend which can not be ignored is an augmented reality extension for messengers. We all have seen those Superman eyes and cute puppy noses in the newsfeed that appear thanks to Snapchat and MSQRD apps. The last one was also bought by Facebook recently, by the way. 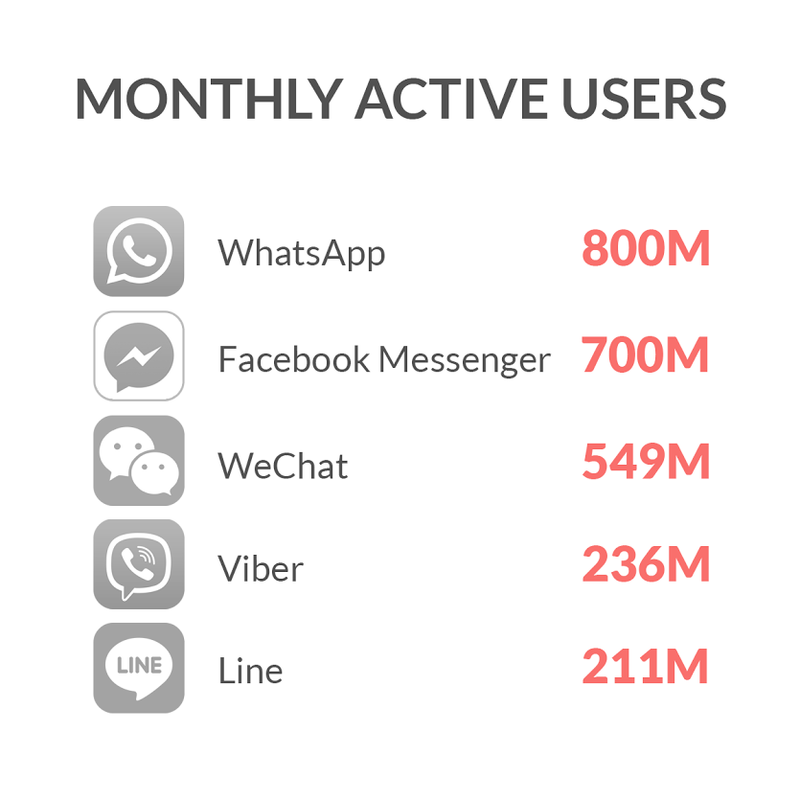 As you can see from this chart, WhatsApp, Facebook Messenger, WeChat, and Viber altogether have about 2.2 billion active global users per month. The important takeaway here is that all these audiences consist of mobile users. How much does it cost to create an app like WhatsApp? As far as WhatsApp is the leader in the market, I will appeal to its features and functionality to describe the whole development process and help you determine what makes up the expenses. The cost to develop an app like WhatsApp depends on the enormous amount of different factors. Of course, there is the basic kit of features that actually makes possible to clone WhatsApp. An approximate cost starts from $20-30K and includes the following scope of features. At the first time, when a user enters the app, he needs to sign in it. The most convenient way to do it is to use his existing phone number. In WhatsApp, they also use SMS confirmation code because for security reasons. Profile customization option helps users create their customized profiles and express their individuality. They can change names and nicknames, background colors or patterns and fonts. This option will cost you a couple of hours of your developers' work. To be more exact it is about 12 hours for iOS app development, 16 for Android and 8 more hours to provide backend. This function is a bit more complicated than it seems at first. 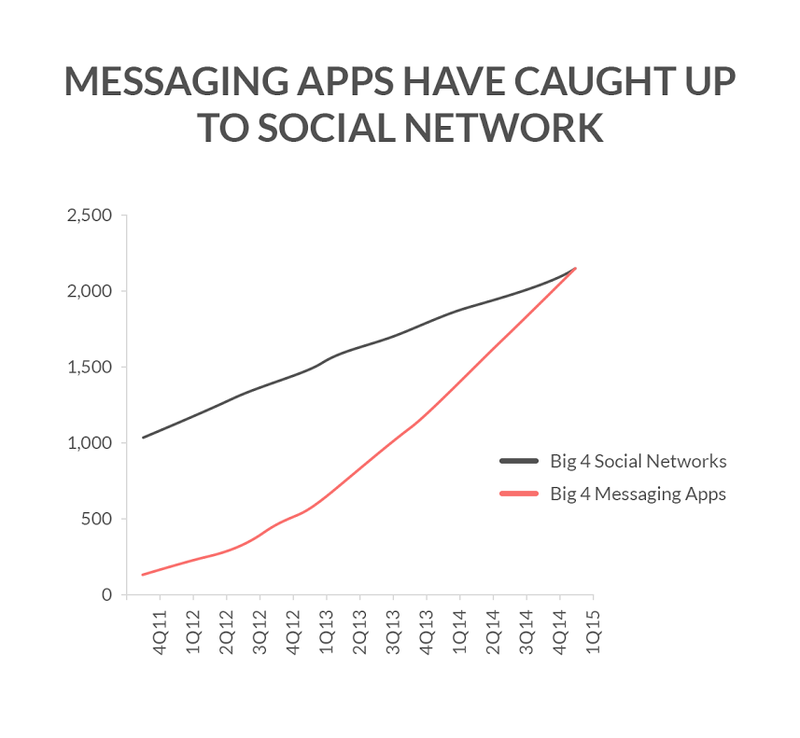 It is evident that your messaging app is supposed to send messages to users. But also it's expected to store the conversation history and provide users with it in case they logged in on another device. For instance, WhatsApp doesn`t store the messages on its server which makes their life much easier. We bet that your users won`t be satisfied with this single characteristic. Especially considering the trends that I have described above. Think about other possibilities that add additional value and give a unique experience to your users. The good example is Snapchat that deletes messages in few seconds after the reading. Also, users are in love with stickers that help to express their feelings. Today custom stickers and smiles became an inevitable part of the digital dialog and sometimes it can turn into additional income entry. You can let users create their stickers. This will bring you more engagement with your app, and this is exactly what we are trying to achieve, aren`t we? You can also consider enabling your users by swapping their photos, gifs, memes and any other photo, video, and audio content. Detailed analysis and study of this option can give you a clue about the distinctive features of your app. For example, in iOS 10 that is going to arrive in fall 2016, users can add some text or drawings on photos and pics. Nice try, indeed. The chart below shows the average time required to implement multimedia file transmission feature. It also makes sense to provide synchronization with cloud services like Google Drive, Dropbox, Evernote or others. Take into account that this option requires time additional time resources. If you want to ensure your users with contact sharing function, it will add additional 7-8 hours for iOS and Android and about 10 backend hours. The option to share your location can be very helpful for your users. And if you make it even more advanced, don`t be surprised if your users use it to navigate each other, set up meetings and stuff like that. Apple MapKit and Google Location SDK give developers tools to create custom solutions for different operating systems. This feature is new even for WhatsApp, and it was added to attract more users. And they succeeded. To compete with such giants as WhatsApp or Viber, this option is essential. Of course, you can release your app without it and add it later. It involves a significant amount of recourses, but the result's worth it. To reduce time spendings, you can use open-source communication libraries (WhatsApp uses PJSIP library). Anyway, this feature is one of the most time-consuming and can take up to 160-200 hours to build. Also, don't forget to set up benchmarks and KPI`s - that's how to create an instant messaging app that will rock! For this sort of app, three essential metrics are a number of active users, retention rate, and audience engagement.